You’ll love this if: You’re looking for great organization techniques and strategies to implement in your workshop. 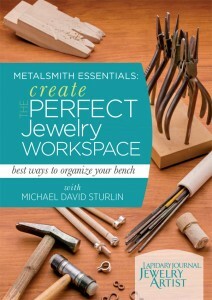 You want precise basic metalsmithing tips for success. Learn how to customize your tools for personal use and explore tips for efficiently using what you already have. Get your copy of this informative workshop DVD today to: Learn how to use your bench pin and customize it for personal use. 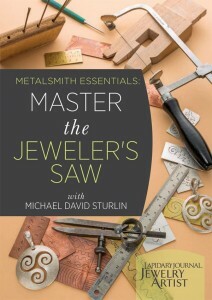 Discover basic ways to use your jewelry tools efficiently that will help make you a successful metalsmith. Add dynamic texturing with tips for success. Easily bend wire and sheet metal with pliers in an effective and safe way. Learn how to get comfortable with a saw so you can successfully practice for accuracy later. Discover how to hold your tool with tender finesse for precision and comfort. Get detailed information about posture, hand position, tension tightness when holding the work, and proper grip strengths for successful sawing. Learn how to listen to the sound of the saw to determine possible problems. Avoid stressing when you break a saw blade (it happens!) and learn solutions for other common mishaps. There is also a series of short vignettes. The first is on making a table top bench block work station:. A new approach to effectively taking a jewelry bench with you wherever you go. How to combine all the convenient aspects of your jeweler’s bench in one block of wood that can be used at a kitchen table, counter, or any flat surface. 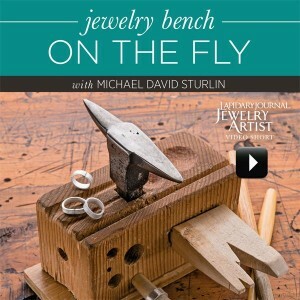 A cost affordable solution to a jeweler’s bench. Additional vignettes on Annealing, Soldering, and Transferring Patterns to Metal are available.